While many people are complaining about the quality of IAW auctions as of late, I think they are taking their natural course, and am thankful for that. The quality is merely what is available. Don't complain about the quality, but rather apply it to your situation. 1) What is your grail list? Do you know? Have you written it out? Do you know the few pieces you will give up your first born for? IAW might not have it, but be ready in case it comes up. One of my grails, the Sword of Kahless recently came up and I snagged it. I don't bid often, but when I do, it is something I really need! 2) Fill out the small items you may not have thought of. Get that Enterprise wall panel, or that Vulcan pistol. There are bargains all over the place. Mine the bottom end of the auction. 3) Contact Colin about the missing pieces you need. If they don't sell it direct, Colin will often put it up on eBay the next week. He is very good about this. 4) Be patient! I am HAPPY that the auctions have slacked off. I spent a ton over the past two years, and need a break! If it is weeks before I find something I like, THANK GOD! 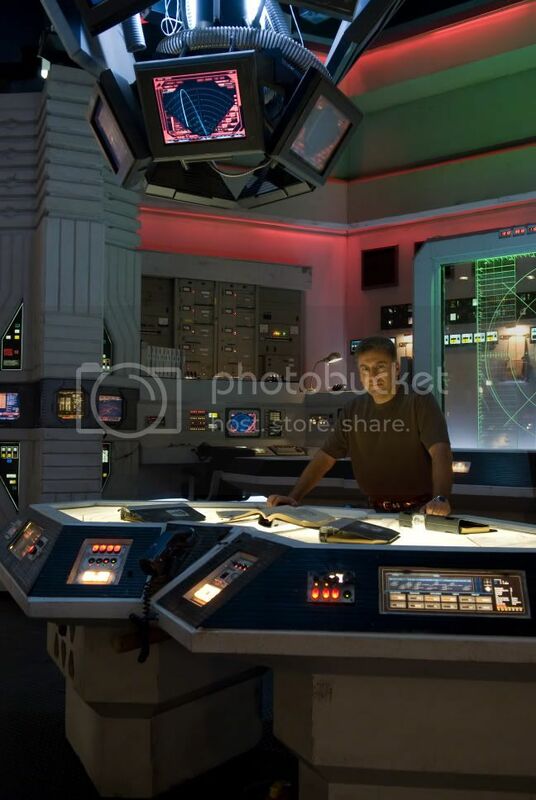 5) Save your money for the Battlestar Galactica Props Auctions! IAW won't say when the auctions will be over. Who cares? Another month, another year. It doesn't matter. Follow your collecting plan and enjoy what time is left! Well, with about 75 auctions already going, IAW decided to list almost 100 more auctions 4 days later. Why? I have no idea. A bad decision for alot of reasons. I have, for the past 20 months, tried to share eBay best practices with IAW. But they never listen. 1) The day you get the highest price on your items is for auctions that end on Sunday. No question, this is a basic axiom of eBay. Everyone knows this. (Monday is second). Now, I don't care if it is Thursday, but IAW should if they are smart business people. 2) There are a loyal group of collectors who want to be able to plan their finances. IAW's lack of a strategy ignores these collectors. We all have limited budgets, whether that is $ 100 a week or $ 10,000 a week. Many collectors work on a two week payroll. 3) Having a consistant start and end date allows people to plan their auction bidding if they don't use a snipe program. How many times has something ended you were going to bid on because you forgot when it ended? 4) Consistency is a corporate value that people respect. It shows that you know what you are doing and are disciplined. Now by this time, we have all formed our opinions of IAW, good and bad. And I will tell you that many of us had negative impressions of IAW based on an inconsistent eBay stragey early on (and the bad customer service early on didn't help either). Do you know consistency is McDonald's main corporate value? They want anyone to be able to walk into ANY McDonald's anywhere in the world and your burger will taste exactly the same in Osaka as it does in Demoines! Finally, most big sellers use an auction management tool like Vendio to manage their business. It allows easy automation of these tasks and allows consistency. I have preached this to Dom for almost 2 years and even offered our service free and nothing. So, you get the picture. I understand that IAW has reduced their staff and thus there is an increased burden on Colin and Brian, (another reason to have an auction management system). Those guys work hard, but this is something EASY that takes no time. I know I am shouting at the wind. Oh well. I still l ove seeing the auctions each week and am thankful for what we get. IAW auctions losing their punch due to direct sales? There has been a lot of talk on the Star Trek Prop, Costume & Auction Forum about how weak the selection is the past few weeks in the IAW auctions. There tend to be half a dozen good items followed by lots of background costumes, small props and pieces of costumes. But this is not surprising. IAW can only have a certain amount of great stuff left. The amount of small or less impressive pieces has always vastly out numbered the hero stuff. And they are certainly out of, or almost out of, many of the great types of uniforms that everyone wants. Main character costumes, Maroons, Romulan costumes, Klingon costumes, Xindi and Reman costumes, Cardassian uniforms (like the one this week), Breen costumes, Generations Naval Uniforms, these are all very popular and IAW is running out, if not out of, most. That is to be expected after almost 2 years of auctions! (Yeah, that's right, December is 2 YEARS). But, one big problem I was made aware of is IAW made a HUGE direct sale to Martin from Germany, (filmweltberlin on eBay) probably the biggest Star Trek collector in the world. The direct sale was one or two CONTAINERS worth of costumes and props. Yes, you heard right. IAW sold whole racks and complete selections of styles to Martin. Wonder why there are few DS9 style Admiral uniforms? Martin has a rack full. Why are there never any DS9 style Admiral buckles? Martin has a whole rack of them. Yeah, Martin was invited into the IAW warehouse and was able to choose whole racks of costumes. He wiped out entire styles of costumes and props. Of course, other great customers like myself, who have spent close to $ 150,000 with IAW have asked to see the warehouse and never been invited in. And Martin is not the first. David from Backlot Props, a nice guy and serious collector and dealer, was invited in just before the IAW Warhouse move. He bought a HUGE selection of costumes and even walked away with a CAPTAIN KIRK MAROON. Yeah folks, that is right. IAW had a Captain Kirk Maroon and direct sold it. Now I have no problem with the sale. If David paid at least what the Christie's one went for (that went to my buddy Bill from the UK for $ 25,000 before buyers' premium) then it was a fair deal all around and I think a good move by IAW who probably wouldn't have gotten that much on eBay. My problem here is that IAW, didn't give others the chance to visit the warehouse and select stuff they wanted. They never had an open house or a warehouse sale...even for their best customers. I can understand not wanting everyone knowing where their location is (they are incredibly paranoid about this), but you would think once you spent a ton of money, they would want to keep you doing so. Certainly the big direct sales were expedient, selling a lot of items quickly. But it is sad that some of us, who have been big supporters of IAW, never got treated the same way. Now, IAW has done direct sales, and I have been a beneficiary of those sales as have others. Colin was very good in putting together a half a dozen or so items I wanted this past year. But I would have loved the privilege to roam the warehouse and pick out what I wanted. When I was out at the Burbank Star Trek Convention this past March, Dom graciously bought myself, Kenny Friedman and Willie Bathe dinner one evening (thank you again Dom) and said he would try and bring us over to the warehouse the next day. Never heard a word from him that day. Oh well! I guess you needed to be able to drop $ 100,000 at one sale to get an invite, and sadly I cannot do that. If that is IAWs criteria for getting into the warehouse, I cannot fault them. I have always said that the better a customer you are, the more attention you get. Simple rule of business. But then again, you would think they would want to take care of their # 1 source of advertising! While this is the 83nd week of auctions, It is titled Week 92 to be consistent with the Star Trek Auctions Archive. There were 96 items this week, with 85% props. Only 6 items topped $ 1,000 and total sales for the week were $ 28,437. Long gone are the days when IAW would regularly top $ 100,000 a week. Buyer fatigue is in full swing. Conversations with my buddies on the Star Trek Prop Forum about the week's offerings are rarer and we all are being very careful what we spend money on. Bargain hunting is the order of the day. Lingering problems with customer service are fewer, and seem to be resolved after a call to Colin. I get an email every two weeks or so asking for IAW's phone # or Colin's email, since contacting Dom is pointless. I know a few buyers who still need to resort to filing PayPal disputes to get Dom to actually answer an email. The slower IAW activity, along with most people knowing that Colin is the guy who gets things resolved, has lead to fewer and fewer complaints. I know Jason White from Moviepropking.com finally got an item that he has been missing for the past year! The Star Trek III/IV Admiral Kirk Costume Lot went strong at $ 2,900. Just a short and pants, it is none theless very recognizable and someone was able to add the beloved James T Kirk to their collection! The Nemesis Style Romulan Fleet Officer Costume went very high at $ 1,550. This one had neither the harness nor the Romulan Empire resin pin for the neckline. Previously these have gone for between $ 480 and $ 810, so this is a significant jump, and not a wise investment at this price. Though it is one of my favorite costumes when kitted out completely. Is there a shill bidder again? We had huge issues with shill bidding earlier in this year and last year, and some people even felt it was IAW doing so. There is a zero feedback bidder again, bidding up costumes, so please watch out. That was the case with the Starfleet Sciences Blue Dress Uniform, which went for a very strong $ 1,483 to forum stalwart Donna. On the high side, but not out of bounds for a uniform that a lot of people really like. The Saavik Starfleet Uniform Lot at $1,176 was pretty reasonable. A cool costume, for my favorite Saavik, Robin Curtis. She was smoking hot and I really liked her take on the character. This is pretty distinct. pair it with some Starfleet Uniform trousers and you have a great display! The Future Starfleet Gold Operations Uniform, which was from Voyager's finale Endgame went for a reasonable $ 911. I happen to love this style of uniform and have all four colors myself. The Voyager Starfleet Scanner was a working prop that lit up. Always favs with collectors, this was a nice metal version. At $ 1,030, it was fairly priced. However, lots of props like this are going WAY less these day, so watch out for the bargain props if you are looking for something. The Klingon Bat'Leth from Marauders went for a respectable $ 1,025. It just needs a little repair where the tips have broken off. The Starfleet Medical Travel Kit was a pretty nice version and went for a reasonable $ 871 to Martin from Germany, who has one of the biggest Star Trek collections around. These just need a medical Tricorder to be complete and this one looked to be in excellent condition. I think the Medical Scanner from "Things Past" and "Extreme Measures" went for a very reasonable $ 647. This one is a light up prop and we saw it at Vegas, where IAW had it displayed. Kind of cool and worth the money I think. Best Costume of the Week: The Star Trek III/IV Admiral Kirk Costume Lot at $ 2,900 was weak in my opinion, but still a Kirk! Best Prop of the Week: The Starfleet Medical Travel Kit was pretty nice and reasonably priced at $ 871. Best Buy of the week: The Feature Film Vulcan Priestess Costume at $ 357 was a steal for a beautiful costume! Sleeper of the Week: The Andorian Energy Carbine at $ 335. Granted it was rubber, but what a deal! Star Trek: Nemesis Romulan Fleet Officer Costume at $ 1,550. While this is the 82nd week of auctions, It is titled Week 91 to be consistent with the Star Trek Auctions Archive. There were only 56 items this week, with a mixture of costumes and props. Only 5 items broke the $ 1,000 mark. A lot of this is due to the ho-hum nature of teh costume selection. Two very good costumes and then a bunch of background costumes. Starfleet uniforms are hanging in the $ 700-900 range, which is a bargain I think. It seems week in, week out, there are a lot of items in the $ 400-500 range, which I think is an indication of people's disposable income at any given time. I hope Colin isn't getting to worn out! The Voyager The Doctor Starfleet Uniform at $ 2,700 was the top costume this week. $ 2,700 for a Doctor costume is twice what Chakotay is bringing these days and shows the desireability of the Doctor's costumes. I won the Enterprise Terran Empire Starship Avenger Female Uniform at $ 2,247 to go with the male version I won last year. These are very popular (probably because of the way women look in them!) and the distinctive style makes them look great on display. Right after that, a standard Enterprise Starfleet Gold Uniform Jumpsuit sold for a strong $ 1,200. This just goes to show how much of a premium command uniforms (like TNG red) go for. The First Contact Lt. Daniels Operations Gold Jumpsuit at $ 1,012 was about right on target. These are great looking uniforms, that look great on display, especially in Operations gold. The Dr. Crusher Stunt Uniform went for a reasonable $ 985. A good looking costume, I always like this version of the TNG jumpsuit as they display great. I actually like the two piece version less. After that, a group of Voyager, TNG and Enterprise costumes went in the $ 700-900 range, showing just how soft the market is. The Enterprise D Replimat LCARS went for $ 1,205. It is interesting each week how many items fail to hit $ 1,500. Seems $ 1,200 is a price people are comfortable spending. This was an Ok piece with food selections on the graphic. I think every TNG fan needs a good LCARS in their collection! I continue to be amazed at how poor some of IAW's titles are. The Illyrian Pistol Prop from "Damage" is also a Vulcan pistol, and so you would think IAW would put THAT in the title. They mention it in the text, but not in the header. I am sure this was not one that Colin wrote, as Colin is pretty good at this stuff. Still, it only hurts IAW. And this was a good buy at only $ 452 WITH a holster! A Nemesis Data Wig went for only $ 330, which I think is an awesome deal! Forum member Lyn stole a Klingon Banner at $ 305 to add to her collection. Trip's Hamonica from "Northstar" went for only $ 305 and was a great deal t that price. Prop prices are falling as the market is totally saturated. Thsi was a great deal. Finally, the Recurring Medical Prop from "Homeward" was seen a lot in TNG and other series and at $ 229 was a steal. It needs some serious restoration, but is a very visible prop. Best Costume of the Week: The Terran Empire Starship Avenger Female Uniform at $ 2,247 was very cool. Best Prop of the Week: The Recurring Medical Prop from "Homeward" was the best in a poor week of props. Best Buy of the week: How I fell asleep and missed Trip's Hamonica from "Northstar" at only $ 305, I don't know! What a deal for a piece that I think personifies the good 'ole boy! Sleeper of the Week: The Recurring Medical Prop from "Homeward" at $ 229 was a steal even though it needs some serious restoration. While this is the 81st week of auctions, It is titled Week 90 to be consistent with the Star Trek Auctions Archive. Wow, only 43 listings this week! But there were some high dollar items that made it a strong, though thin, week. The Commander Riker two piece Starfleet Uniform went strong at $ 4,156. Well, he is a popular character, and so the price doesn't surprise me. A solid buy and a costume that will definitely hold its value. The costume was a great deal at $ 3,207. The Nemesis Viceroy costume is awesome, but sadly has no boots! In a costume like this, I find that disappointing. generally, I dont care a bout shoes or boots, but in this costume, they are an essential part of the costume. Giles Aston, my good friend, forum member and Picard look-alike, has one of these and the boots relaly are spectacular. So, though I am not crazy about this, at $ 3,205 it is still a nice costume. Now, once again we see an Original Series Sciences Jumpsuit. This one went for a healthy $ 2,356, which was more than the $ 1,800 or so the previous ones have averaged. I happen to think these are pretty ugly, but none the less, it is from TOS. At $ 1,976 the Geordi LaForge costume from First Contact was pretty nice and with boots will look awesome on display. I really like this one, and I am not big on civilian costumes usually. Commander Chakotay's Starfleet Uniform at $ 1,526 was pretty fair for a nice costume WITH a rank pip! A First/Second Season Red Command Jumpsuit went for $ 1,325, which shows how popular these red command background jumpsuits are. The Vulcan Maiden Costume & Jewelry Lot went surprisingly high at $ 1,235. Kind of boring on my book, but that is just me! The 6th Captain Kirk Rock Climbing Costumes sold for $ 1,125. Now this has become a running joke, but this is actually a great deal on a costume that was Kirk's! So if you want a Kirk, ther eis no cheaper way to get a complete Kirk costume. Finally, I love the Starfleet Prototype Uniform Jumpsuit at $ 909. What a cool piece of Star Trek history! Best Costume of the Week: The Nilz Baris TOS costume was a gem! Best Prop of the Week: None! Hardly any props, and what there was sucked! Star Trek: TNG Commander Riker two piece Starfleet Uniform at $ 4,156. Star Trek: TOS The Nilz Baris TOS costume at $ 3,207. While this is the 80th week of auctions, It is titled Week 89 to be consistent with the Star Trek Auctions Archive. This was a poor week. Only 4 items above $ 1,000 and those just barely so! We have been seeing a lot of that lately as IAW is putting more and more low dollar items up each week. Parts, insignia and less desirable items. I guess that has to be expected after 80 weeks of auctions! There just isn't that much good stuff left. And I am happy about that as I am just tired (and broke!) as most people are. The grand discussions that happened each week on the Star Trek Prop, Costume & Auction Forum have slowed down as there is less to get excited about. I am now linking to Burt's Star Trek Auction Archive rather than eBay auctions ads since the eBay ads go away after 30 days, but Burt's Archive is forever! So every link below links not to the auction ad on eBay, but to the item on the archive. The TMP Gray Class C Starfleet Jacket Wrap sold for a reasonable $ 1,283. This was a really nice uniform and there are actually a lot of people trying to get one of every type of TMP uniform. I just think these will always hold their value. The Reginald Barclay Starfleet Uniform Jacket went for a reasonable $ 1,225. Barclay is always a popular character and the only part of this I didn't like is it had no pants! The Tuvok Uniform with Boots at $ 1,207 was just crazy! That is so damn cheap! I can't believe how cheap Voyager character costumes have been going. Load up now! The Enterprise Sciences Blue Starfleet Uniform from "These are the Voyages", the final Enterprise episode, went for a healthy $ 1,032. That is a good price in that these are the rarest form of Enterprise uniforms (outside of the Mirror Universe style. These uniforms are distinguished by epultes on the shoulders, the second Starfleet patch on the right arm, and a small name patch on the left chest. For only $ 900, the First Contact style sciences blue uniform was a good deal. These are just beautiful uniforms that look fantastic on display. The Feature Film Style Environmental Technician's costume at $ 810 was a good deal in that it had boots. Kind of boring though, but still interesting. The Operatrions Gold Starfleet Uniform was a good deal at $ 810 too. These are what you think of when you think TNG and this was priced right. The Voyager "Mari Equipment Prop from Random Thoughts" was the most expensive prop this week. It lights up but wasn't THAT important to the episode. I guess because both Neelix and 7 of 9 were in the scenes, someone fell in love with it. It doesn't do it for me, but I am not the biggest of Voyager fans, even though I do like it. Well, different strokes and all! At $ 800, Captain Archer's Na'kuhl Communicator from "Storm Front" was a good deal for a neat looking prop. It lights up and has a sequence of lights. It was also used by T'Pol in that episode, so I think that makes this even cooler. Overall a good deal on a really nice episode-specific prop. I also really liked the Nemesis Starfleet Type II Phaser with Holster at $ 670. This was really a great deal and I gave it my sleeper of the week. You got a hard rubber Phaser AND A holster! I really think this was a total steal. And you can never go wrong with a Klingon Drinking Tankard! Best Costume of the Week: The TMP Gray Class C Starfleet Jacket Wrap wasn't great, but it wa sthe best this week. Best Prop of the Week: The Captain Archer's Na'kuhl Communicator from "Storm Front" was a cool looking prop. Best Buy of the week: The Tuvok Uniform with Boots at $ 1,207 was a steal! Sleeper of the Week: The Nemesis Starfleet Type II Phaser with Holster at $ 670. Star Trek: TMP Gray Class C Starfleet Jacket Wrap at $ 1,283. Star Trek: TNG Reginald Barclay Starfleet Uniform at $ 1,225. Star Trek: Enterprise Sciences Blue Starfleet Uniform from "These are the Voyages", at $ 1,032. While this is the 79th week of auctions, It is titled Week 88 to be consistent with the Star Trek Auctions Archive. Note that there were 3 items in Week 87 according to Burt, but I am rolling that into Week 88. Not going to do a blog on 3 items! The Captain Archer Uniform was a great deal at $5,100 as it came with rank pins and boots. We rarely see Captain's uniforms so complete. And $ 5,100 is about as cheap as you can expect to get one for these days. The fact that it is autographed is kind of irrelevant. Thank God IAW was smart enough to just get it autographed on the tag. The DS9 Colonel Kira Bajoran Militia Costume went for a reasonable $ 3,447. I think there are way better looking Kira's, but none the less, this came with boots a holster and pins, so not a bad deal. The Star Trek V Sybok Costume went for a healthy $ 2,551. This was the best of the Sybok's we have seen so far and had all the pieces. Star Trek Prop Forum old timer Aaron Carlson, the man with the largest STar Trek V collection in the known universe, won this costume to go with his other Star Trek V goodies. The Tom Paris Starfleet uniform lot went cheap at $ 1,185. Not sure why Voyager character costumes go so cheap. Outside of the Doctor and 7 of 9, the characters have been cheap for a while. The Star Trek: The Motion Picture Brown Collared Class A Costume at $ 848 was a good deal on a very cool costume. These costumes will only go up in value as they are really overlooked. The Enterprise Half Missle at $ 2,304 was pretty cool. Mount this on your wall and impress your friends when they visit your home theater! (Not as cool as Daryl's whole missile, the only one IAW has sold so far as I know. The Rounded Borg Interface Panel at $ 1,251 was just about the same exact price as the last one that sold. Not bad, and fairly interesting. Reasonable at this price. The Star Trek III Pair of Genesis Organisms went for a very strong $ 1,225, more than double what a similar (or maybe the same) set went for last time. Of course, these are rubber, but they seem to have held up well. I was very happy to win the Romulan Wall Flat from Enterprise at $ 866. I really wanted it to use as a back drop for my Romulan costume, and I think I won it at a good price. Best Costume of the Week: The Captain Archer Uniform at $5,100 was the cream of the crop. Best Prop of the Week: The Enterprise Half Missle at $ 2,304 was pretty cool! Best Buy of the week: The Tom Paris Starfleet uniform lot was a STEAL at $ 1,185! Sleeper of the Week: At $ 610 the UFP table was a great deal! Star Trek: DS9 Colonel Kira Bajoran Militia Costume at $ 3,447. A member of the Star Trek Prop, Costume & Auction Forum pointed out this ad. 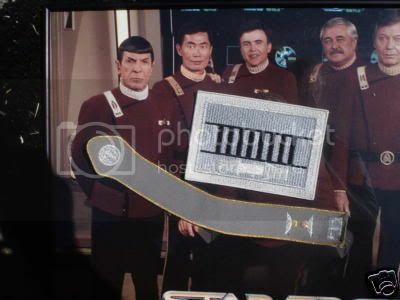 It is for a set of patches that the seller claims were used on Star Trek. I informed the seller that they were not in fact used on the set, and most probably used in the Universal Studios "Star Trek" Ride from the 1990's. When informed about this, the seller got nasty with me, claiming I had no idea what I was talking about and that I was being "vulgar" by questioning her auction. I know you are all smart enough to avoid sellers like this, but just remember, "Be careful out there!". This email was sent from IAW the other day to selected customers. The It’s a Wrap! Star Trek Auction has a commitment to make available related material wherever a fair price can be reached and in any fashion that best suits our goals and those of our client. The preferred method of sales has been, and will remain online listings as opposed to direct sales. The company knows that customers and collectors have very specific interests and at any time customers are more than welcome to send the company a wish list by email. Knowing what customers want only helps the auction in its efforts to make items available. Information about the quantity of items available and the frequency of their listing that comes from any source outside the It’s a Wrap! Star Trek Auction should be treated as speculation. As usual, I never get any of the emails from IAW. My buddy Dana had to send it to me. If Dom had ever listened to me and gotten an auction management system, that wouldn't be an issue. One of their biggest customers and I don't even make their email list! Geez. What this also shows is that IAW does in fact do direct sales. But of course you still have to get their attention, and Colin can only do so much.